2. Where do Shirataki Noodles come from? 3. What are Shirataki Noodles made of? 4. What do Shirataki Noodles taste like? 5. What are the benefits of Shirataki Noodles? 6. Where can I buy Shirataki Noodles? The Name “Shirataki” comes from Japan and means freely translated “white waterfall”. Its name mirrors the look of the Shirataki noodle, which is thin, transparent and gelatinous. Traditionally, the Shirataki noodle is made from the „Konjak Yam“, which is a root and in Japan also known as devil’s tongue root or elephant root. Hence the reason, Shirataki noodles are often called YAM noodles. Where do Shirataki Noodles come from? Traditionally the Shirataki noodle comes from Japan. There they are still being produced today and form a big part of the Japanese cooking. The Konjak plant has been especially known for its valuable healing properties since the 6th century. During the Edo era in the 17th century the Shirataki noodle was also exported into China. However, the preparation of this noodle in all the different Asian regions varies greatly. In the Kanzai province in the south of the country people used to cut the Shirataki noodle from the jelly of the devil’s tongue, the Konjac Yam plant. This Konjac noodle is slightly thicker than the Shirataki noodle, slightly brown and today very popular and mainly consumed in China. In contrast, in the Japanese Kanto Region the Yam noodle extract is pushed through small holes and then fall into a hot concentrate. The readily available Shirataki noodles are mainly processed in this way. What are Shirataki Noodles made of? The noodles are made from the flour of the Konjak root. It is being processed into a gelatinous substance, from which these noodles are then pressed. Traditional Shirataki noodles do not contain any carbohydrates and are gluten free. This makes them especially great for low carb and vegan diets. The very low calorie content of the Konjak root has been known for centuries to being beneficial for losing weight, which it is still being used for and popular today. Because of its fibrous surface and the incredibly high water content this noodles also has a very satisfying effect. Since the Shirataki noodle does not contain any gluten or fat, it is an extremely low in calories. One kilogram of Shirataki noodles only contains 60 calories, whereas one kilogram of commercial wheat in comparison contains 3,680 calories. The Shirataki noodle in its raw form is relatively tasteless, which is also due to its high water content. What’s so great about our Shirataki noodles is the fact that they will absorb the taste of the sauces very well. Here, yet another benefit comes into play, as the missing surface starch won’t allow the Shirataki noodles to change the original taste of sauces and the noodles won’t stick together, as it is usually the case with normal pasta. Your very first Shirataki noodle dish will revolutionize your kitchen. Tastes and textures are being presented in a completely new light and it will change the traditional compositions of your usual dishes. What are the benefits of Shirataki Noodles? 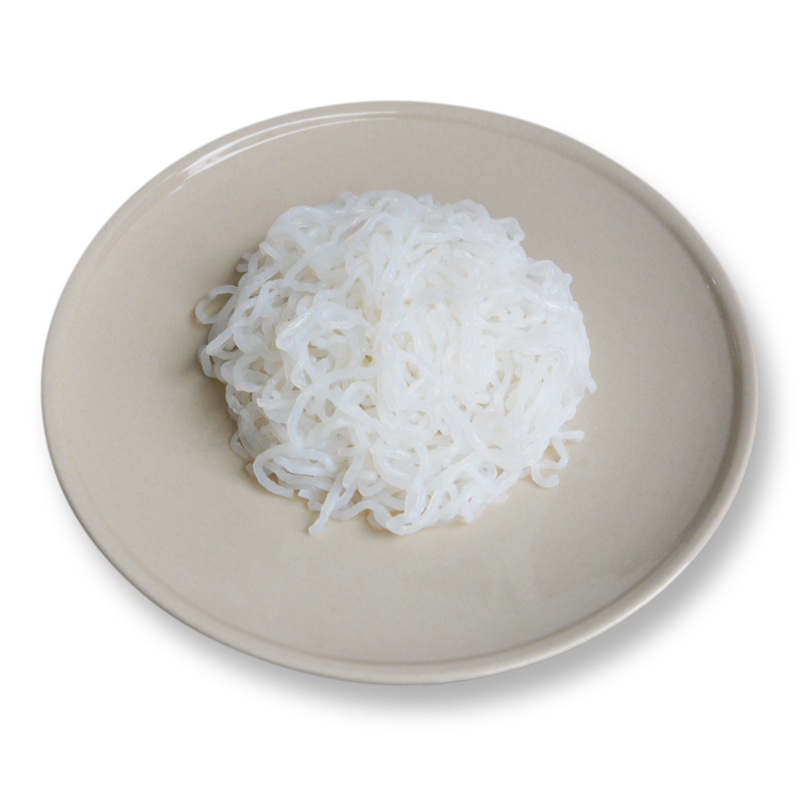 The main benefits of the Shirataki noodles can be found in its origin and composition. The noodle, which is being manufactured from the jelly of the Konjac root, is extremely low in calories and rich in water content. For a low carb or weight loss diet, or even if you just want to pay attention to healthy eating, these Shirataki noodles are the best option. Yet another benefit is the neutral taste and flavor of the noodles. Because they don’t contain any starch, which means that they won’t change the flavor or taste of any dishes or sauces. Suddenly things taste completely differently and this will change how traditional dishes will be prepared from thereon in. So far, Shirataki noodles are still largely unknown in Europe. Only selected supermarkets or specialty stores might offer the Shirataki noodles in their deep frozen isle. In Asian markets it is even possible, to buy the Konjak Jelly in its raw form, as well as packaged, non-frozen Shirataki noodles. 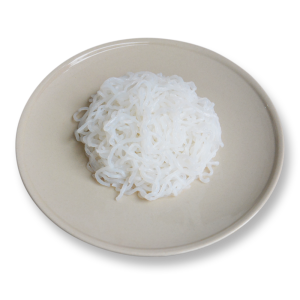 It is much faster and simpler, when you order the various different types of Shirataki Noodles directly in from our webshop, where you will be able to buy fresh Shirataki Noodles online.